I have always been attracted to the literature-based approach to homeschooling. That was why when my eldest son was 4 and I was set in my mind to homeschool him for preschool, I chose to use the Sonlight Curriculum, a homeschool curriculum well-known for its literature-based emphasis. So what exactly is the literature-based approach? In a nutshell, it means using authentic texts or books (instead of textbooks, workbooks and flashcards) as the basis for learning. In the classical approach to homeschooling, such books are known as the "Great Books". In the Charlotte Mason homeschooling approach, they are referred to as "living books". These book are usually classics or books that are so well-written that they engage the reader by exciting the imagination and stirring the emotions. In other words, they make the subject "come alive". 1) It is important to make the learning of Chinese enjoyable and meaningful. 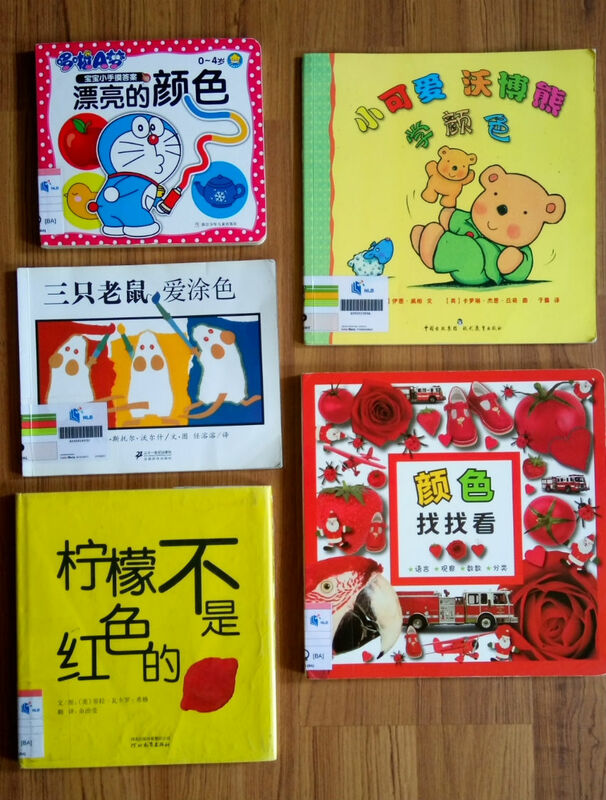 2) Children should be exposed to good Chinese literature from the youngest age possible. Parents should try to inculcate in their children a love for Chinese books by reading to them often and demonstrating a real interest in the books themselves. 3) If Chinese is less spoken at home, it is important to read more Chinese books (compared to English ones). 4) The use of age-appropriate Chinese audio-visual materials can help to create interest and increase exposure to the language. This is especially helpful if the language is hardly used at home. When my two older boys were homeschooled during their preschool years, they enjoyed being read to in Chinese and were able to express themselves in the language well. Sadly, when I stopped the practice of reading to them and they subsequently entered school, they lost interest in the language and gradually grew to dislike it due to the demands of the curriculum. I always wondered how the young boy (each of them) who always requested a favourite Chinese book to be read again and again could one day proclaim, "I hate Chinese!" :( I can still remember how well they could express themselves with words and phrases they learned from story books when they were younger. Somehow, when the reading sessions stopped (due to busyness and changes in family circumstances), the interest gradually died. Eventually, English being the predominant language used at home and in school, took centrestage. Now that I am homeschooling my youngest boy, I am making a conscious effort to help him enjoy the language. When we visit the library, it is my practice to check out more Chinese books than English ones. There was a season when I borrowed mainly Chinese books and read those books to him often. During that period of time his Chinese improved by leaps and bounds. He would initiate conversation in Mandarin and make up stories using words and characters from the stories he heard. When I felt he was on track I gradually increased the number of English books to be read to him. I am convinced the literature-based approach is the way to go for teaching Chinese if I want to make the process meaningful and enjoyable. We borrowed the following books from the library that are related to the theme. 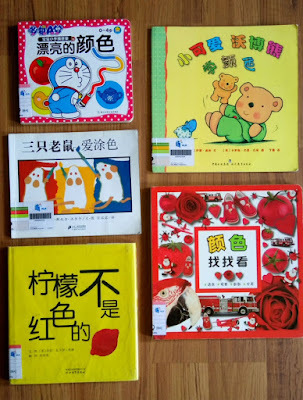 Many good Chinese children's books are translated from other languages. The selection below is no exception. You may recognise that two of them are the Chinese versions of the popular "Mouse Paint" and "Lemons Are Not Red". If I know a particular title is available in both English and Chinese, I would make a conscious effort to introduce the Chinese version first. I think this is helpful for most Singaporean children as for most of them, English would be their preferred language of use. As the books are all on the same theme, reading the books means there is a consistent exposure to words related to the theme. In this case, we kept coming across the Chinese words for common colours like red, orange, yellow, green, blue and purple. The increased exposure to the same words presented in different contexts in the books helps to contextualise meaning and reinforce learning. Please note that for the preschool years, the emphasis is not on individual word recognition but on the development of oral and listening skills. The best thing to do for this stage is to cultivate a love for reading and learning. If individual words are taught, they should be done in a meaningful and playful way free from stress. 1. Colour Scavenger Hunt - The book "颜色找找看" is about looking for items in the book that have a particular colour. We did an extension activity after reading the book by doing a "colour scavenger hunt" at home. I conducted the whole activity in Chinese and asked him to bring me items he can find around the house that are of a particular colour. This is a fun activity that got him running about the house looking for things. Through this activity, words and concepts related to the theme are reinforced. 2. 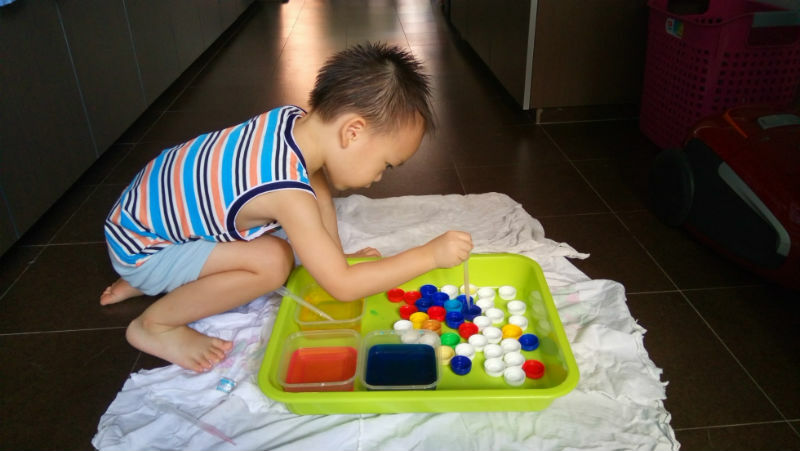 Fine Motor Water Play and Colour-Mixing - The book "三只老鼠爱涂色" introduces the three primary colours (red, yellow and blue) and the concept of colour mixing to obtain secondary colours (orange, green and purple). 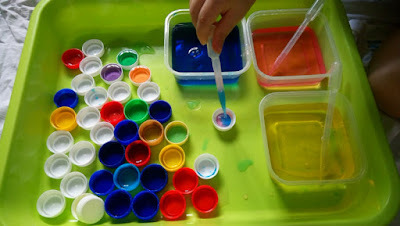 After reading the book several times, I did the following fine motor water play and colour mixing activity with David. 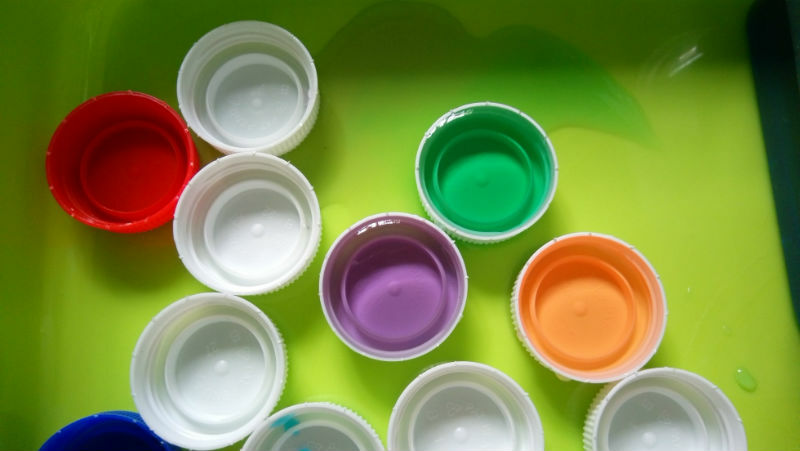 I prepared 3 containers of coloured water with a dropper (pipette) in each. David had to use the droppers to transfer coloured water into the bottle caps. Here he is at work! This water transfer activity requires a certain degree of precision and control. 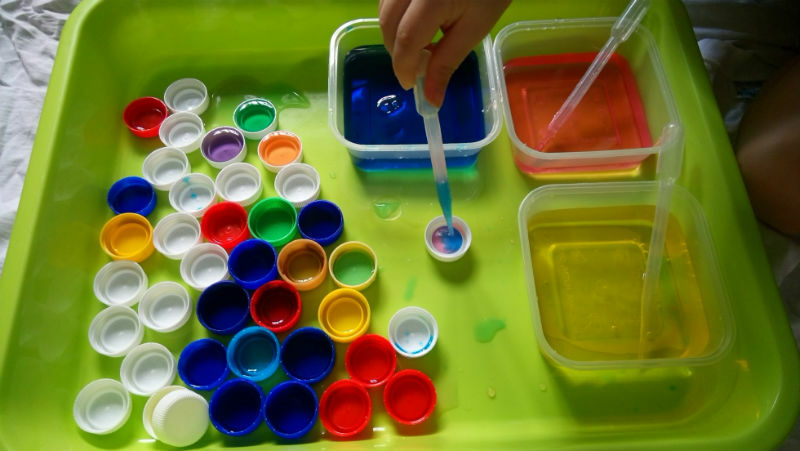 It is a good activity to practise fine motor skills as well as hand-eye coordination. 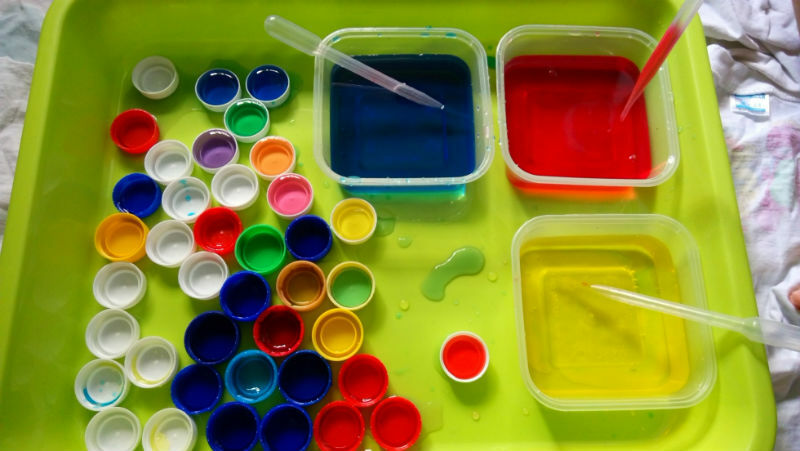 The picture above shows colour mixing in progress. He had already transferred some red water into the bottle cap. When he released blue water into the cap the colour of the water quickly turned to purple. A closer view of the results of colour mixing. The colours orange, green and purple were all obtained by mixing two primary colours together. As we did this activity, I talked about how the mice in the book "三只老鼠爱涂色" did colour mixing just like him. We reviewed parts of the book verbally as he did the colour mixing. This process certainly reinforced his learning as he was personally involved in the hands-on activity as well as the narration of parts of the story. I really enjoy the literature-based approach in homeschooling. I use this approach for teaching both English and Chinese, but I make an extra effort in the early years to do more for Chinese as I know (and statistics have shown) that it is a language that is more difficult to learn and master. It does not help that the overall environment in Singapore is not favourable to the learning of the Chinese language. Step into our local libraries and one would see a vast difference in terms of the number of English and Chinese books in the children's section. The audio-visual selection for Chinese materials is pathetic compared to what we have in English. In school, the number of hours children are exposed to the Chinese language is way less compared to the total amount of time instruction is conducted in English. Most children now come from English-speaking families, and if they come together to play and interact, they would mostly be doing so in English. The list goes on. The first three years of a child's life are especially important when it comes to oral development in any language. If parents do not make an effort to expose their children to Chinese and cultivate a love for learning it early in life, it would not be surprising if their children find it difficult to learn or even like the language. Personally, I feel there is a lot in the Chinese language and culture that many youngsters fail to appreciate. God has given mankind diverse languages since the Tower of Babel. Each is unique, useful and beautiful in itself. As Singaporeans, we are very fortunate to be able to learn two languages from a young age. We have an extra key to unlock treasures of knowledge and ideas compared to people who are monolingual. Most importantly (in my opinion), we are in a very good position to bring the gospel to the Chinese-speaking world. Hudson Taylor was able to work hard at learning Chinese so he could be a missionary to the people in China. Isn't it a shame that many Singaporean Chinese complain and say they hate Chinese because it is difficult to learn?